Fried foods and I have a love-hate relationship. I love to eat them, but I hate how high in calories they are. It is hard to resist a crunchy fried food. Since my switch to a low calorie diet, I have done a pretty decent job at omitting fried foods. There is one fried food that I occasionally dream about though: onion rings. I love all things onion. I also love the crunchy battered onion rings that come straight out of the fryer. Unfortunately, fried onion rings are entirely too high in calorie for me to enjoy a full serving. So, I decided to make onion rings I could eat a full serving of without feeling guilty about calories. Baking foods instead of frying them is obviously a no brainer. However, sometimes baking doesn’t provide the same flavors that frying does. I have experimented with a recipe for baked onion rings that puts all fried onion rings to shame. These onion rings make me forget all about the fried ones. They have a crunchy coating on them that is reminiscent of a fried batter. They burst with flavor that is so unexpected for a baked onion ring. I can eat 22 of these baked onion rings for less than the amount of calories in two Arby’s Steakhouse Onion Rings. Yes, you read that correctly. The calorie factor was enough for me to try these rings. Now, I can’t stop craving them. These are the best onion rings I’ve had in my entire life. The first step real step in this recipe is to grind the high-fiber bran cereal twigs with the spices. For the cereal, I used Original Fiber One. The cereal has a slightly sweet flavor, but is very mild. It does not make the rings taste like bran, trust me. I placed the cereal in a cup for my Nutribullet, but feel free to use a blender or food processor. I mixed the spices in with my cereal before grinding so that everything would blend together. 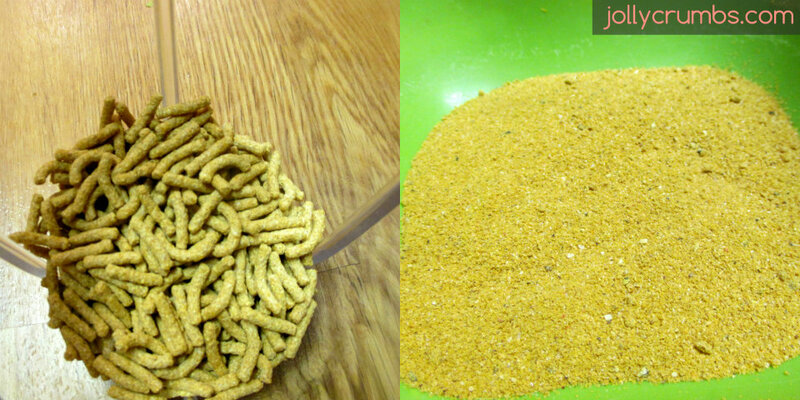 Once the cereal and spices are ground together, place half the coating in a bowl. Reserve the other half to use midway through making onion rings. The coating will get clumpy because of the egg on the onion rings, so it is helpful to have a batch of fresh coating reserved to use on the onions. 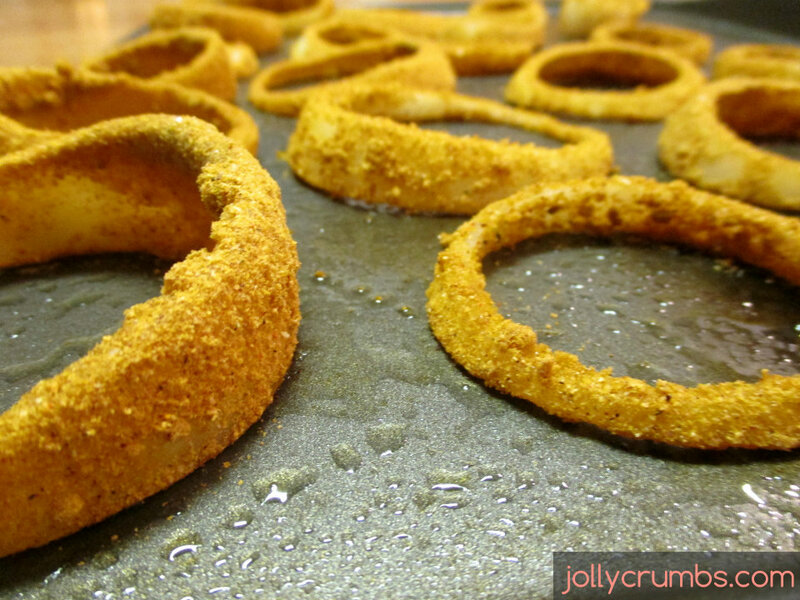 When you are ready to start coating the onion rings, place one ring at a time in the egg substitute. Make sure the ring is fully coated, and use a fork to lift the ring out and shake off the excess. Do not pierce the onions. I stuck my fork through the hole in the onion to balance it. After getting rid of excess egg, drop the onion into the coating. I shake the bowl so the coating completely covered the ring. I also used a fork to flip the ring over to make sure it is entirely coated. Once it is coated, use a fork to place the ring on a prepared baking sheet. Once you have all the rings coated and placed on the baking sheet, give the rings a light spray with nonstick cooking spray. Place the rings into the preheated oven and bake for 18 to 20 minutes. You will flip the rings over halfway through baking. I baked mine for 9 minutes, flipped them all over, and baked for another 9 minutes. The onions do shrink, so don’t be concerned if you notice a change in size. There may also be some crunchy rings, but those are just as tasty in my opinion. Just keep an eye on them depending on how your oven cooks. 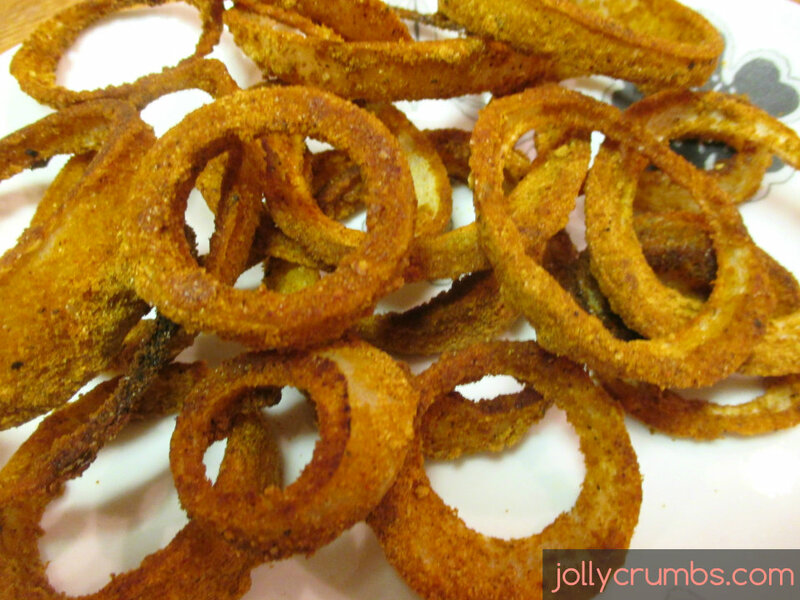 These onion rings are a wonderful combination of crunchy, soft, slightly sweet, and savory. There are so many delicious flavors with these onion rings. I’ve made these several times, and each time they get better and better. I have experimented with spices, and this time was right on the money. These taste like they are from a restaurant. This has got to be one of my favorite recipes to make. It is so easy, unbelievably low calorie, and is so dang tasty! 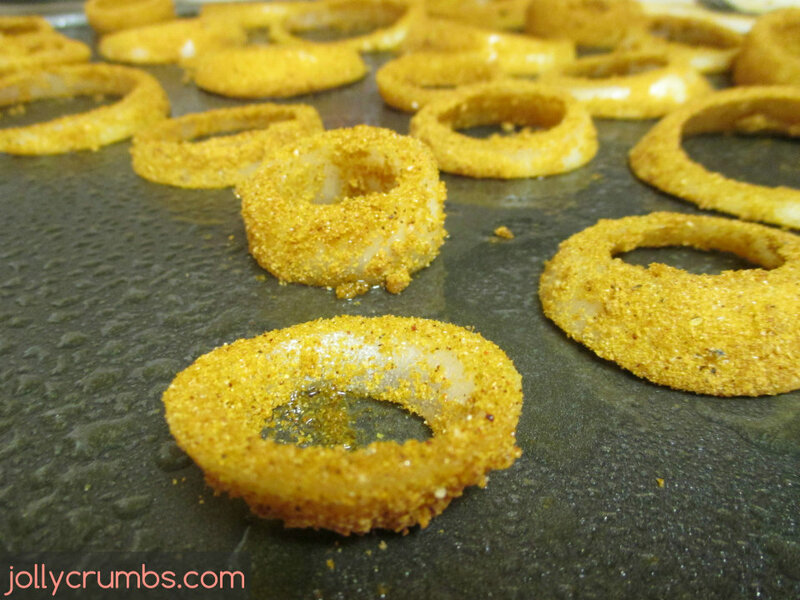 If you are an onion ring lover or know someone who is, you should give these a try and experiment with the spices. I have loved these every time I’ve made them, and each time is different than the last! Preheat oven to 375°F. Spray a baking sheet with nonstick spray. Slice the ends off the onion, remove outer layer and skin. Cut onion into ½ inch wide slices. You will want thicker rings because they shrink. Separate slices into rings, and set aside. Using a blender, food processor, or Nutribullet (this is what I used), grind the cereal and spices to resemble breadcrumb consistency. Place half of the coating into a bowl. Fill another small bowl with the ¼ cup egg substitute. One at a time, place each ring into the egg substitute. Using a fork to balance the rings (don’t pierce them), lift the rings out and shake them to remove excess. Then, place rings into the coating and use a fork to make sure the entire ring is coated. Lift rings out and place them on the prepared baking sheet. When the coating becomes clumpy and wet, remove those crumbs and place the reserved crumbs from step 3 into the bowl. This will help keep all new rings coated and not clumpy. Spray the rings lightly with nonstick cooking spray. Bake the rings in the oven for about 18 to 20 minutes. Flip the rings over halfway through baking. You don’t use the entire ¼ cup egg substitute. I only used about 4 tablespoons, but it makes it easier to have more in the bowl to dip the rings in to. You can use any spices you’d like in the coating for these rings.